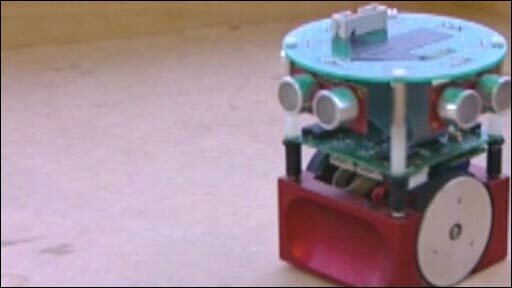 Dr Ben Whalley, from the University of Reading has carried out tests on the 'rat- brain-controlled' robot. A robot controlled by a blob of rat brain cells could provide insights into diseases such as Alzheimer's, University of Reading scientists say. The project marries 300,000 rat neurons to a robot that navigates via sonar. The neurons are now being taught to steer the robot around obstacles and avoid the walls of the small pen in which it is kept. By studying what happens to the neurons as they learn, its creators hope to reveal how memories are laid down. The blob of nerves forming the brain of the robot was taken from the neural cortex in a rat foetus and then treated to dissolve the connections between individual neurons. Sensory input from the sonar on the robot is piped to the blob of cells to help them form new connections that will aid the machine as it navigates around its pen. As the cells are living tissue, they are kept separate from the robot in a temperature-controlled cabinet in a container pitted with electrodes. Signals are passed to and from the robot via Bluetooth short-range radio. The brain cells have been taught how to control the robot's movements so it can steer round obstacles and the next step, say its creators, is to get it to recognise its surroundings. Once the robot can do this the researchers plan to disrupt the memories in a bid to recreate the gradual loss of mental faculties seen in diseases such as Alzheimer's and Parkinson's. Studies of how neural tissue is degraded or copes with the disruption could give insights into these conditions. "One of the fundamental questions that neuroscientists are facing today is how we link the activity of individual neurons to the complex behaviours that we see in whole organisms and whole animals," said Dr Ben Whalley, a neuroscientist at Reading. "This project gives us a really useful and unique opportunity to look at something that may exhibit whole behaviours but still remains closely tied to the activity of individual neurons," he said. The Reading team is not the first to harness living tissue to control robots. 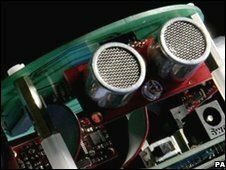 In 2003, Dr Steve Potter at the Georgia Institute of Technology pioneered work on what he dubbed "hybrots" that marry neural tissue and robots. In earlier work, scientists at Northwestern University Medical Center in the US wired a wheeled robot up to a lamprey in a bid to explore novel ways of controlling prosthetics.